The vast majority of Americans think that mothers (96%) and fathers (85%) should be able to take leave from work following the birth or adoption of a child, and at least nine-in-ten say workers should be able to take leave from work to care for a family member with a serious health condition (94%) or to deal with their own serious condition (97%). But views about whether workers should receive pay while they are on leave for these reasons vary. While majorities say workers should be paid for family and medical leave, support for paid leave is higher for workers who are dealing with their own health condition and for mothers who have just had or adopted a child. Smaller shares – though still majorities – of Americans say that workers who are caring for an ill family member should be paid during their time away or that fathers should be paid for time off following the birth or adoption of a child. In fact, 15% of the public says fathers should not be able to take leave to care for a new baby or adopted child, regardless of whether or not they get paid. For the most part, those who are in favor of paid family and medical leave say the pay should come from employers rather than from the federal or state governments. But Americans are divided when it comes to government mandates on employer-paid family and medical leave: 51% say the federal government should require employers to pay their employees when they take leave from work for family or medical reasons, and a similar share (48%) say employers should be able to decide for themselves. 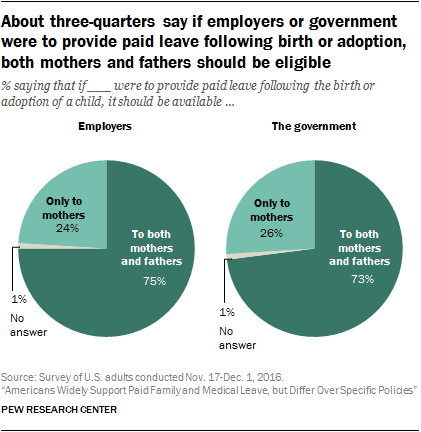 Overall, about three-quarters of Americans say that if the government or employers were to provide paid leave following the birth or adoption of a child, it should be available to both mothers and fathers. Moreover, 85% say that if the government were to provide paid leave for family and medical reasons, it should be available to all workers regardless of income. When asked about specific proposals for dealing with employees who need to take leave from work for family or medical reasons, more than four-in-ten (45%) say they would strongly favor the government providing tax credits to any employer that offers paid leave and 39% would strongly favor the government allowing workers to set aside monthly pretax contributions into a personal account that can be withdrawn if they need to take leave from work. Smaller shares say they would strongly favor a government paid leave program funded through higher taxes on wealthy people or corporations (28%) or a government fund that all employers and employees would pay into through payroll contributions to provide paid leave to any worker who needed it (24%). Americans are largely supportive of paid leave for mothers and fathers following the birth or adoption of a child, but more say mothers should receive pay when they take leave from work during this time than say fathers should (82% vs. 69%). Americans are also more supportive of workers receiving pay when they take leave from work to deal with their own serious health condition (85%) than when they take leave to care for a seriously ill family member (67%). Support for paid leave in each of these situations is widespread across demographic groups but, in each case, women are somewhat more likely than men to say people should receive pay when they take leave from work. For example, while about three-quarters (73%) of women say fathers should receive pay when they take leave following the birth or adoption of their child, about two-thirds (65%) of men share this view. Similarly, seven-in-ten women say workers should have paid leave to care for a family member with a serious health condition, compared with 63% of men. Young adults are also generally more supportive of paid leave than older adults, and the difference is particularly pronounced when it comes to paid leave for fathers. About eight-in-ten adults ages 18 to 29 (82%) say fathers should be able to take leave following the birth or adoption of a child and receive pay during that time, compared with 76% of those ages 30 to 49, 61% of those 50 to 64, and 55% of adults 65 and older. 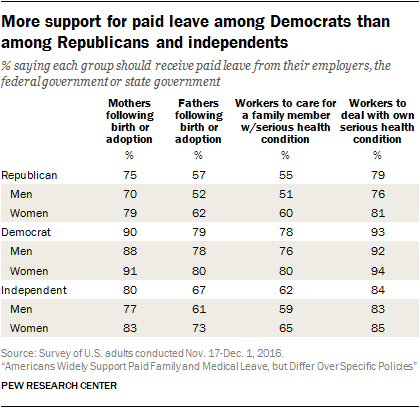 Views of paid leave also differ across party lines, with Democrats generally more supportive than Republicans and independents. Still, at least three-quarters across each of the three groups say mothers should be able to take paid leave following the birth or adoption of a child and that workers should be able to take paid leave to deal with a serious health condition. When it comes to fathers taking leave from work, 57% of Republicans say they should be able to take paid leave following the birth or adoption of a child; a similar share (55%) of Republicans say workers should have paid leave to care for a family member with a serious health condition. In contrast, about eight-in-ten Democrats support paid leave in each of these situations (79% and 78%, respectively). Independents are in the middle: 67% say fathers should have paid leave following the birth or adoption of a child, and 62% say workers should have paid leave to care for a family member who is seriously ill.
Republican women tend to be more likely than Republican men to support paid leave. About six-in-ten Republican women (62%) say fathers should have paid leave following the birth or adoption of a child, compared with 52% of Republican men. Similarly, while 60% of Republican women say workers should have paid leave to care for a family member with a serious health condition, about half (51%) of Republican men share this view. Gender differences among Republicans are also evident when it comes to paid leave for mothers, but majorities of both groups say mothers should be able to take paid leave following birth or adoption (79% of Republican women and 70% of Republican men). Among independents, gender differences are only notable when it comes to paid leave for fathers. About three-quarters (73%) of independent women say fathers should be able to take paid leave, compared with 61% of independent men. Democratic men and women are about equally likely to say people should have paid leave in each of the four situations asked about in the survey. Among those who support paid leave, majorities say pay should come from employers, while relatively few say government – either federal or state – should provide pay. This is particularly the case when it comes to paid leave for fathers and mothers following the birth or adoption of a child and to workers who need to deal with their own serious health condition: At least seven-in-ten of those who say people should be able to take paid leave in each of these three situations say the pay should come from employers (76%, 74% and 72%, respectively). When it comes to paid leave for workers who take time off to care for a family member with a serious health condition, opinions about who should provide pay are somewhat less lopsided. Although a majority (59%) say pay should come from employers, about four-in-ten say it should come from either federal (22%) or state (20%) governments. Majorities of Democrats, Republicans and independents who say workers should be able to take paid family and medical leave look to employers to cover the cost. But Democrats tend to be more supportive than Republicans of federal government-paid leave. Among those who say fathers should be able to take leave and receive pay during that time, 18% of Democrats say the pay should come from the federal government, compared with 10% of Republicans. One-in-ten among each group say state governments should provide pay. The same pattern is evident among those who say that mothers should receive pay when they take leave following birth or adoption and that workers should receive paid leave to care for a family member’s serious health condition or their own condition. In each case, Democrats are more likely than Republicans to say pay should come from the federal government and Republicans are more likely than Democrats to say pay should come from employers; both groups are about equally likely to say pay should come from state governments. Views about how long a worker should receive pay while they are on leave for family or medical reasons differ according to the circumstances. Among those who say mothers should have paid leave when they take time off from work following the birth or adoption of a child, 75% say they should receive pay for at least six weeks. 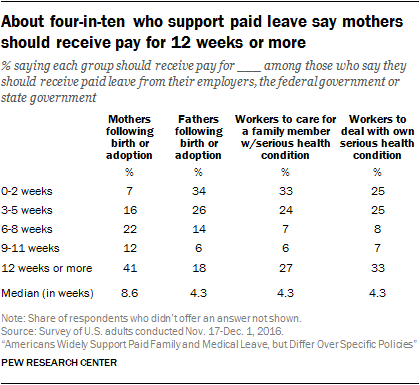 This includes 41% who say mothers should receive 12 weeks or more of paid leave. A far smaller share (38%) of those who say fathers should receive pay following birth or adoption say they should be covered for six weeks or more, with just 18% saying fathers should have at least 12 weeks of paid leave; about a quarter (26%) say fathers should receive between three and five weeks of paid leave, while about a third (34%) say fathers should receive pay for two weeks or less. Among those who say workers should have paid leave from work to care for a family member with a serious health condition, a third say workers should receive pay for up to two weeks and 24% say these workers should receive pay for three to five weeks; four-in-ten say workers should receive pay for at least six weeks, including 27% who say they should receive pay for 12 weeks or more to care for a seriously ill family member. A quarter of those who say workers should be able to take paid leave to deal with their own serious health condition say workers should receive pay for up to two weeks, and another quarter say they should receive between three and five weeks of paid leave; a third say workers should receive at least 12 weeks of paid leave to deal with their own serious condition. While Americans tend to favor employer-paid over government-paid leave for family or medical reasons, they are about evenly divided when it comes to whether or not the federal government should require employers to provide paid leave. 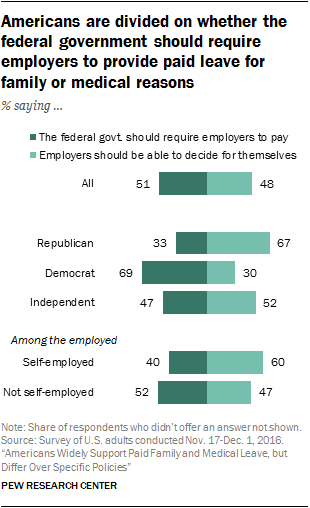 About as many say the federal government should require employers to pay their employees when they take leave from work for these reasons (51%) as say employers should be able to decide for themselves (48%). There is a sharp partisan divide on this issue. About seven-in-ten Democrats (69%) say the federal government should require employers to provide paid leave, while 30% say employers should be able to decide for themselves. Republican views are nearly the mirror image of those of Democrats: 67% of Republicans say employers should be able to make their own decision about whether or not to provide paid leave, while 33% say the government should require employers to do so. Independents are more evenly divided, with 52% saying employers should be able to decide for themselves and 47% saying the government should require employers to pay their employees when they take leave from work for family or medical reasons. Among Republicans, those who describe their political views as conservative are far more likely than those with more moderate views to say employers should be able to decide for themselves; 74% of conservatives say this, compared with 54% of moderate or liberal Republicans. Views on this question do not vary significantly between Democrats who describe themselves as liberal and those who say they are moderate or conservative. Perhaps not surprisingly, among the employed, self-employed adults are considerably more likely than those who are not self-employed to say employers should be able to decide for themselves whether to pay their employees when they take leave from work for family or medical reasons: 60% of those who are self-employed say employers should have a choice, compared with 47% of those who are not self-employed. Support for a federal mandate requiring employers to provide paid leave is particularly widespread among those who indicate that workers taking leave should receive pay from either the federal or state government. Still, even among those who say pay for workers who are on leave should come from employers, half or more (depending on the reason for taking leave) say this should be required by the federal government. Those who say workers should not be able to take leave or should be able to take leave without pay are the most opposed to a federal government mandate. For example, among those who say mothers should receive paid leave from either the state or federal government, 66% say the federal government should require employers to provide pay, as do 55% of those who say mothers should receive paid leave from their employers. 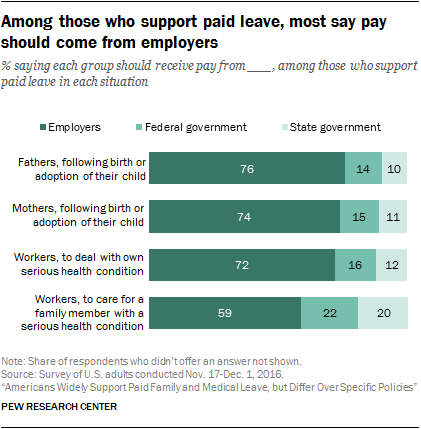 In contrast, just 16% of those who say mothers should have unpaid leave or should not be able to take leave at all say the government should require employers to provide paid family and medical leave. Three-quarters of Americans say that if employers were to provide paid leave to their employees following the birth or adoption of their child, the benefit should be available to both mothers and fathers; about the same share (73%) say paid leave should be available to both if the government were to provide it. About a quarter say paid leave should be available only to mothers, whether provided by employers (24%) or the government (26%). Older Americans – particularly older men – are the most likely to say paid leave should be available only to mothers following the birth or adoption of a child, if it were to be available at all. Overall, about six-in-ten adults ages 65 and older say both mothers and fathers should benefit if employers (60%) or the government (58%) were to provide paid leave, while about four-in-ten say this should only be available to mothers. In contrast, about eight-in-ten adults younger than 30 and ages 30 to 49, and about seven-in-ten among those 50 to 64, say paid leave should be available to both mothers and fathers if employers or the government were to provide this benefit. Older men and women express significantly different views on whether both mother and father or just mothers should receive paid leave if employers or the government were to provide it. Among women 65 and older, about two-thirds say both parents should have access to paid leave if employers (66%) or the government (64%) were to provide it. Men in this age group are about evenly split, with about half saying paid leave should be available to both parents and the other half saying it should be available only to mothers. Republicans are more likely than Democrats or independents to say that, if employers or the government were to provide paid leave, it should be available only to mothers, but majorities across all three groups say both mothers and fathers should have access to this benefit if available. For example, about six-in-ten Republicans (62%) say that if the government were to provide paid leave, it should be available to both mothers and fathers, while 37% say it should be available only to mothers. Larger majorities of Democrats (81%) and independents (74%) say both mothers and fathers should have access to paid leave if the government were to provide it, while 19% and 24%, respectively, say only mothers should. The pattern is similar when it comes to employer-provided paid leave. When asked whether paid leave should be available to all workers or only to those with lower incomes, more than eight-in-ten (85%) Americans say that if the government were to provide paid leave for family or medical reasons, this benefit should be available to all workers regardless of their income; 14% say it should be available only to those with low incomes. While large majorities across demographic groups say all workers regardless of income should have access to paid leave if the government were to provide it, those with lower incomes are somewhat more likely to say it should be available only to workers with low incomes. One-in-five Americans with annual household incomes under $30,000 say this, compared with about one-in-ten (11%) of those with incomes of $75,000 or more. While Americans express broad support for paid leave for fathers and mothers following the birth or adoption of a child and for workers who need to care for an ill family member or deal with their own serious health condition, there is no clear consensus about the best approach to provide paid leave for workers who need it for family or medical reasons. Of four proposals tested, the most popular is the government providing tax credits to employers that provide paid leave, with 45% of Americans saying they would strongly favor this approach. About four-in-ten (39%) say they would strongly favor the government allowing all workers to set aside monthly pretax contributions into a personal account – similar to a flexible spending account – that can be withdrawn if they need to take leave from work. 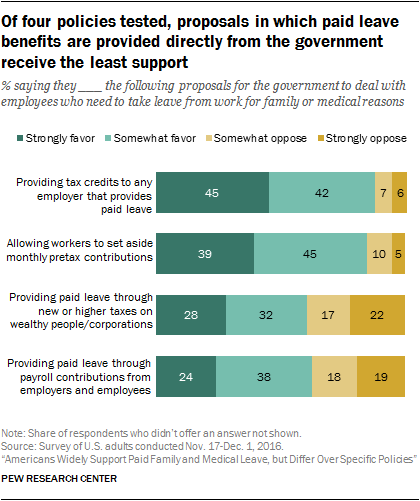 Proposals in which paid leave benefits are provided directly by the government receive less support: 28% of Americans say they would strongly favor a program where the government would provide paid leave to any worker who needs it using funding from new or higher taxes on wealthy people or corporations, and 24% express strong support for the establishment of a government fund that all employers and employees would pay into through payroll contributions in order to provide paid leave to any worker who needed it. Overall, majorities of six-in-ten or more say they would at least somewhat favor each of the four proposals to provide paid leave to workers who need it for family or medical reasons. But far more say they would strongly or somewhat oppose government-paid leave programs funded through new or higher taxes on the wealthy or corporations (39%) or through payroll contributions from all employers and employees (37%) than say they would oppose the government providing tax credits to employers that provide paid leave (13%) or allowing workers to set aside monthly pretax contributions into a personal account to be withdrawn if they need to take leave from work (15%). Democrats are far more supportive of these proposals than Republicans or independents. About eight-in-ten Democrats (78%) would favor a program where the government would provide paid leave with funding from new or higher taxes on the wealthy or corporations; just over half (56%) of independents and just 38% of Republicans would favor this. And while about three-quarters (74%) of Democrats would be at least somewhat supportive of a government fund which employers and employees would pay into through payroll contributions, this proposal receives narrower support from independents (57%) and Republicans (53%). There is more partisan agreement when it comes to the government allowing workers to set aside monthly pretax contributions into a personal paid leave account (88% of Republicans and 83% each of Democrats and independents would favor this at least somewhat) and providing tax credits to employers that provide paid leave (84%, 91% and 85%, respectively). Still, Democrats are far more likely than Republicans or independents to say they would strongly favor tax credits for employers that provide paid leave; 53% say this, compared with 37% of Republicans and 41% of independents.